In a historical classic as enthralling as a novel, author Jim Bishop colorfully depicts the city of Washington as it is celebrating the end of the Civil War. With research carefully gathered over 25 years, he weaves details together so skillfully, that even though you know the outcome, the suspense heightens with each unfolding event. It’s Good Friday, April 14, 1865. While all around him, people demand vengeance on the subdued southern states, the President plans to rebuild demolished cities and send captured Secessionist soldiers home to plant their crops. At the famous Ford’s Theatre across town, popular actor John Wilkes Booth furtively makes final preparations to destroy the man he blames for all the nation’s problems—President Lincoln. 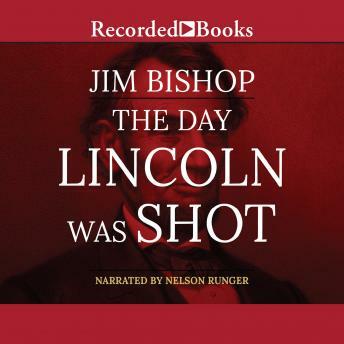 Jim Bishop dramatically describes crowds swarming the streets on that fateful day, while Lincoln meets with politicians, relaxes at the theatre, and finally, struggles for each agonizing breath. Veteran narrator Nelson Runger brings each political leader and infamous rogue vividly to life.